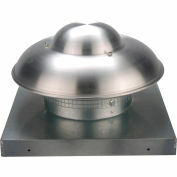 Hooded roof ventilator can supply airflow with quiet operation. Industrial roof ventilator provides vertical discharge using enclosed, fan cooled industrial grade motors. This roof ventilation fan is weatherproof to ensure long life. 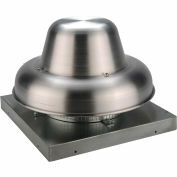 Hooded roof ventilator features a belt driven axial fan. Aluminum hood and included OSHA-compliant bird screen keeps out unwanted rain, snow and even prevents birds from nesting. Rugged aluminum weather hood is made with 1/8" angle iron support frame. Includes fan body and curb cap for mounting. Heavy duty fabricated steel propeller has four 10 gauge fan blades bolted to 1/4" thick backplate with welded taperlock hub and bushing. 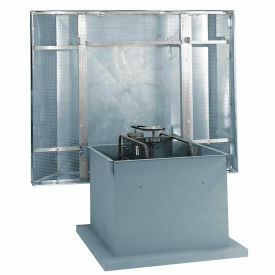 Heavy duty 14 gauge fan panels are welded to 10 gauge motor base. 24" Ventilator features 1/2" schedule 40 pipe motor base supports. 3 Phase Motor is field convertible from 230V to 460V. Horsepower rating based upon maximum speed/load.